There’s a reason someone invented scented candles that smell like freshly baked cookies. And nothing beats having your home smell like one giant, ooey gooey cookie. But we prefer the real deal. So when the craving strikes, follow our classic peanut butter cookie recipe. Whether you’re baking for one (no judgment) or a crowd, you can easily scale this recipe to accommodate larger volumes. The great news? The average pantry is stocked with all the basics needed to whip up a batch of these quick and delicious peanut butter cookies. So we don’t take this quick and yummy cookie recipe for granted, let’s test our knowledge on the history of peanut butter cookies. Can guess when the first peanut butter cookie recipe went public? Try not to ask Google. Did you guess the early 1900s? Ding, ding, ding! 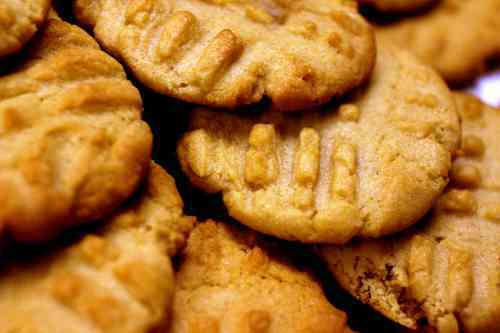 As far as we can tell, the first peanut butter cookie recipe went public sometime around 1916. And while we’re not sure who it was that clued everyone in on this delectable treat, we’re quite thankful they did. Bonus question: why do peanut butter cookies always feature fork hash marks? The most common reason comes from traditional baking practices; impressing the top of the cookie with a fork aids the cookie in cooking more evenly, and as an indicator to people with peanut allergies that cookie contains nuts, since it’s sometimes hard to know what type of cookie it is by eye sight alone. Now that you’re a scholar in the history of peanut butter cookies and best baking practices, let’s get this cookie party started. Happy baking! In a bowl combine white sugar, brown sugar and shortening. Using a mixer at medium speed, beat the ingredients together until they're light and fluffy. Add vanilla, salt, peanut butter and beat eggs in. Add flour, baking powder and baking soda. Stirring until mixed. Chill dough for one hour. Roll dough into 1 inch balls and put on cookie sheets. Flatten each ball with a fork, making a crisscross pattern. Bake in a preheated 350 degrees F. oven for about 10 minutes or until cookies begin to brown.